This year’s winner of “Best in Show” at the 55th Annual MEA/MAEA Art Acquisitions Purchase Exhibition is an artist and teacher who exemplifies the circle of life in education. Josh Gove, a first-year elementary art teacher in St. Johns, says he credits skilled and encouraging educators from his youth for his love of art and desire to teach. “I owe a lot to my art teachers,” he said. Now he’s fostering his students’ creativity in the district where he grew up, after earning a bachelor’s degree in Fine Arts from Alma College and K-12 certification from Central Michigan University. 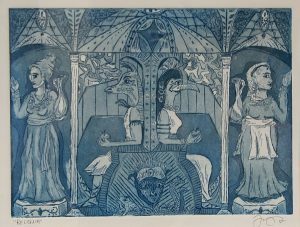 Gove’s piece, “Reliquia,” demonstrated “true mastery” of intaglio printmaking, according to juror Dr. Michelle Duran, an assistant professor of Art history in Ball State University’s School of Art. The challenging and labor-intensive printmaking process uses designs etched on metal plates, ink, and an acid dip to create the image on paper. “I was impressed with the amount of detail and the overall composition, and I found the monochromatic palette to be a soothing and complementary background for the exploration of the various shapes and figures,” Duran said. His grandmother encouraged him in whatever he pursued, including art and education, he said. Gove is also a former high school and college tennis player who now coaches the varsity boys’ team at St. Johns and serves as an assistant coach at Alma College. In the MEA/MAEA art exhibit two years ago, Gove had a piece accepted and purchased while he was still a student at CMU. He was “shocked and surprised and very honored” to have his entry win this year’s top prize. The exhibit is open to the public and runs through May 7 (Mon-Fri 8 a.m.-5 p.m. – excluding April 19/Good Friday) and will be posted online by April 1. Below is a list of those accepted, awards bestowed by the juror and purchases made by MEA and MAEA. I urge you to do some coverage on the misuse and predation on staff that work as itinerate teachers as a cost cutting measure. In addition to traveling, art, PE, and music itinerate are given a grueling schedule with little administrative support and evaluations that have little relevance due to the circumstances of being a traveling teacher.